I had low expectations for this film. And you know what, after a slow start, I really got into this comedy. Maximo (Eugenio Derbez) made a vow after witnessing the truck that his father had accidentally driven though their house explode to find a way to have money and not work. And he found that way… becoming a gigolo for older, rich women. He lived comfortably for many years with his sugar momma until he was dumped for a car salesman, leaving Maximo broke and struggling to find his way. He wound up staying with his sister Sara (Selma Hayek) and her son Hugo (Raphael Alejandro), and began a plot to seduce a new rich older woman (Raquel Welch). I started out being pretty bored with this film. Then, something strange happened. I really started to enjoy it. I give most of the credit for this film’s turn around to the wonderfully written relationship the film developed between Maximo and Hugo. This unlikely pair really became the driving force behind the movie and turned Maximo from a one-note character into something more. The scenes where Maximo is trying to help teach Hugo how to get the girl that he had a crush on (Mckenna Grace, who just started in Gifted) to like him are great. Of course, Maximo’s reasons were not selfless as he wanted the chance to seduce the girl’s grandma, who was coincidentally the rich woman he was hoping to meet (Welch). Sure the story was pretty predictable. You knew that, despite his motives being less than admirable, Maximo would wind up connecting with Hugo and then would do something to show his original motives- causing a rift between them. That is exactly what happened. And yet, I was so engaged by the Maximo-Hugo relationship that I forgave the predictability of the situation. We also had some really great scenes between Maximo and his sister Sara. This relationship was developed, allowing Maximo to use his ability to pick up women as a strength to help Sara get past her fears and go out with a nice guy she had liked. The humor here was hit and miss, but there was more funny than not. Sure they did plenty of over the top jokes that were misfires (including the jokes involving Welch’s arms) but there was also a sweetness to these people that made you want to root for them. Maximo may not have been your typical protagonist, but I found him to be likable and relatable. Plus… “Weird Al” Yankovic makes a cameo! That was equal levels of unexpected and awesome. There are other characters in the film and some of them do not work nearly as well. Rob Lowe is fine as Maximo’s fellow gigolo friend, but Rob Riggle and Rob Huebel are nothing more than bullies and used as foils for Maximo. Raquel Welch’s role is also not a strong section of the film, but her inclusion leads to the wake up call that Maximo needed. Michael Cera plays the car salesman that seduces Maximo’s old flame and he is great in his short time on screen. Kristen Bell’s role is a funny one, but fairly unrealistic and I honestly do not remember who Rob Corddrey played. Lind Lavin (from “Alice” fame) does have a small, but wonderful cameo that works extremely well. The real strength of this film is your three actors, Eugenio Derbez, Selma Hayek, and Raphael Alejandro, who have great chemistry with one another and are developed into solid, three-dimensional characters. 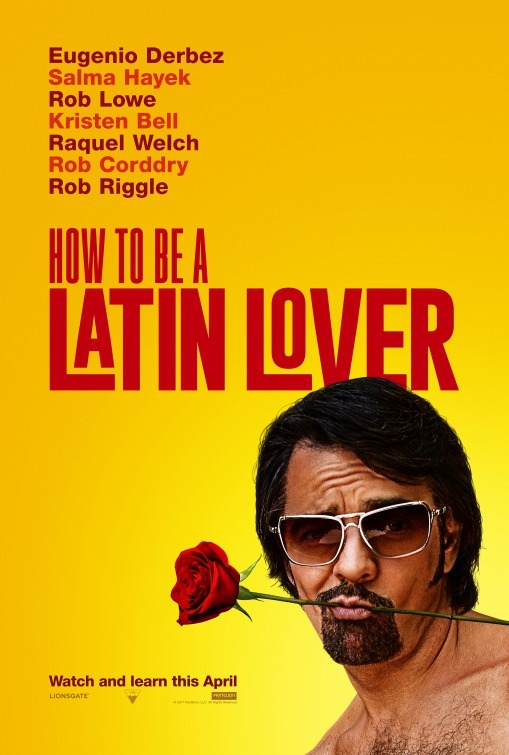 I found myself invested in these three characters and I enjoyed the second half of How to Be a Latin Lover very much. It is a little uneven of a film, but it really picked up steam when the main character decides to become a real character.